During the Normandy invasion, 30 paratroopers landed in the town of Sainte-Mère-Eglise , including 20 on the church square. On 7th June at noon, reinforcement troops, who had landed on Utah Beach were there to clear Sainte-Mere-Eglise. Soldiers of the 101st Airborne Division in Carentan, 1944 at the junction of Rue Holgate and Rue 101ème Airborne. 101st Airborne troops march through the town of Sainte-Marie-du-Mont during Operation Overlord, June 1944. It was the first town liberated during this operation. Street scene in St. Mere Eglise after its capture by the US Army 10 June 1944. Besides the aidstation of Sainte-Mère-Eglise, June 1944 a little mother or grandmother is passing by. Carentan, Rue Holgate 45, two American soldiers are resting in the park of the hospital, between June 28 and July 13th 1944. St. Mere Eglise, 6 June 1944. St. Mere eglise was one of the first towns liberated. This is one of 2 famous photos taken by S.C. personnel at the road junction directly south of Turqueville, France, on 7 June, 1944. Soldiers of the 101st Airborne Division are capturing me. 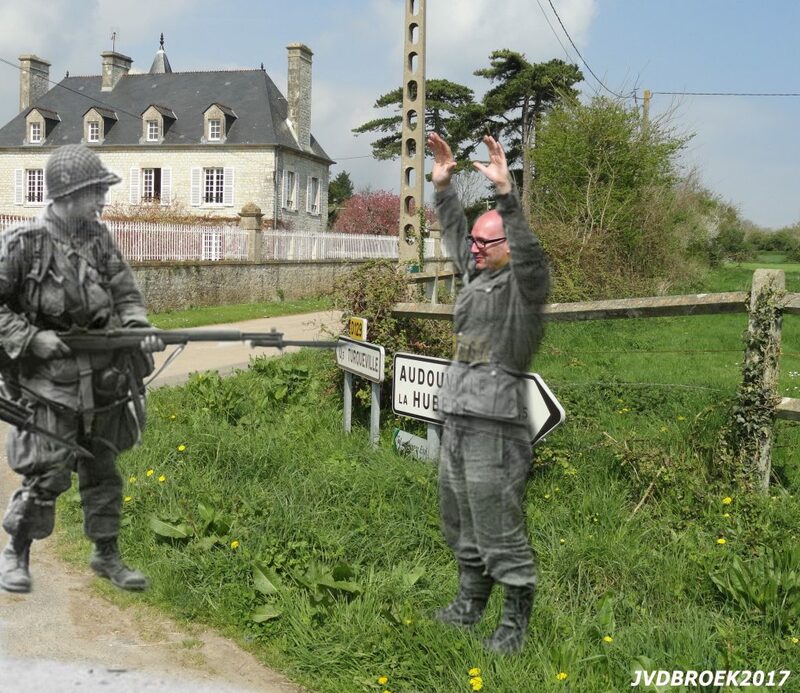 GI from the paratroopers of the 327th Glider Infantry Regiment, 101st US in front of a road sign at the Rue Sebline in Carentan. June 12, 1944: Marie-Esther Duchenes, Red Cross volunteer with personnel of an Engineer Special Brigade in the city center of Sainte-Marie-du-Mont. Me and my friends trying to recreate the same shot. My sister is acting as Marie-Esther Duchenes.